Michael Smart / For Shaw Media Woodstock North Football Head Coach Jeff Schroeder (center) talks with the coaching staff prior to entering the locker room at halftime of Friday's, September 12, 2014 game against Woodstock. Michael Smart / For Shaw Media Woodstock's Garrett Boyle receives the ball from quarterback Jace Pohlman during Friday's game against Woodstock North at Woodstock North Friday, September 12, 2014. Michael Smart / For Shaw Media Woodstock North's #77 Cody Barnes brings down Woodstock's #16 Zachary Cullum as teammates #37 Jeremy Haymond and #55 Vincent Maltese assist at Woodstock North Friday, September 12, 2014. Michael Smart / For Shaw Media Woodstock North's #37 Jeremy Haymond prepares to break through toward the goal before making a touchdown in the first half of Friday's game against Woodstock at Woodstock North Friday, September 12, 2014. Michael Smart / For Shaw Media Woodstock North's Jeremy Haymond runs for a touchdown against Woodstock at Woodstock North Friday, September 12, 2014. Michael Smart / For Shaw Media Woodstock North's #3 Jimmy Krenger runs for the endzone to score the first touchdown of the game during their game against Woodstock at Woodstock North Friday, September 12, 2014. 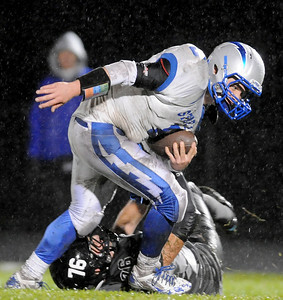 Michael Smart / For Shaw Media The rain never stopped Friday night as Woodstock's John Kruse prepares to catch a kick return from Woodstock North at Woodstock North Friday, September 12, 2014. 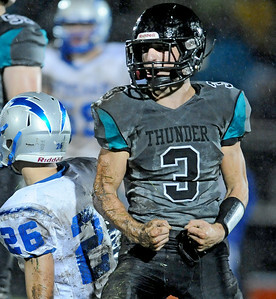 Michael Smart / For Shaw Media Woodstock North's #3 Jimmy Krenger flexes after tackling Woodstock's #26 Alex Shannon at Woodstock North Friday, September 12, 2014. Michael Smart / For Shaw Media A pile of Woodstock defensmen try to stop the running game of Woodstock North at Woodstock North Friday, September 12, 2014. Michael Smart / For Shaw Media Woodstock North's Jordan Plummer tries to squeeze through Woodstock defense at Woodstock North Friday, September 12, 2014. Michael Smart / For Shaw Media Woodstock's #8 Jace Pohlman is taken down by Woodstock North's #76 Jacob Britton at Woodstock North Friday, September 12, 2014. 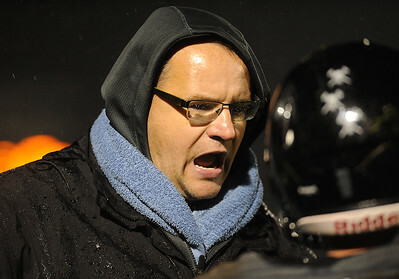 Michael Smart / For Shaw Media Woodstock North Football Head Coach Jeff Schroeder talks to a player on the sideline during a game against Woodstock at Woodstock North Friday, September 12, 2014. 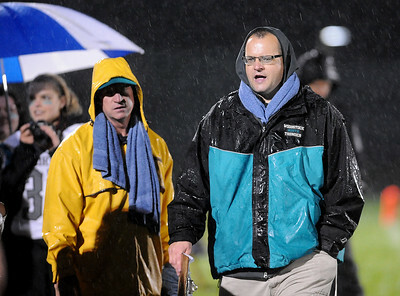 Michael Smart / For Shaw Media Woodstock North Football Head Coach Jeff Schroeder walks the sideline of Friday, September 12, 2014 game against Woodstock. Woodstock North's #3 Jimmy Krenger runs for the endzone to score the first touchdown of the game during their game against Woodstock at Woodstock North Friday, September 12, 2014.